The new page looks great. Frank and Mike you guys did a great job. Wow!! great job! 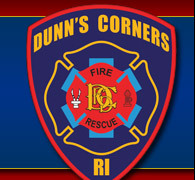 This is one more reason why Dunn's Corner Fire Department is one of the best volunteer fire depts. in the country. Congratulations on a very successful opening of the new site. The presentation made at the monthly meeting was a very good introduction for those not already familiar with the site. This represents a lot of time and work well spent. This is only the end of the initial phase. I'm sure that this site will evolve and grow as time passes. Thanks for a job well done. This is certainly one way for DCFD to put their best foot forward. Thanks, again especially to Frank Aldrich, as well as Mike Frink. Looks great from North Carolina. Keep up the good work. Hope to be on the web soon. I just wanted to take this time to thank you and all that helped put this site together. I know you have all worked very hard and countless hours to bring this site to what it is today. I think that our members and the members of our community will benefit greatly from the information posted on this site. It will also help our fire district and our contracting fire districts better understand what we do and how much effort the men and women of our department put in to protect our community. Again thank all of you and a job well done. Website is coming out good. Nice job.